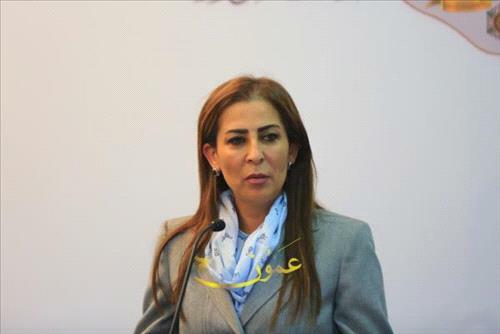 AMMONNEWS - Minister of State for Media Affairs, Jumana Ghunaimat, on Sunday warned of the risks posed by "rumors" on the society as they "negatively impact people's beliefs and harm values and principles". Deputizing for Prime Minister Omar Razzaz to launch an initiative dubbed "Tahqaq" (corroborate) at the University of Jordan, Ghunaimat, the government spokesperson said: "The failure to stand up to rumors will eventually harm the society's security and weaken cohesion," noting that the law criminalizes the fabrication and dissemination of rumors. "We seek to entrench an objective media that delivers the news quickly and accurately," she said, pointing out to the measures undertaken by the government to respond to rumors and limit their proliferation. She called upon the students to be part of this meaningful initiative so that it could be a platform to spread awareness and a tool to protect the society alongside other platforms that aim at tackling rumors.